Boatrocker is best known these days for its Belgian style ales, big, malty beasts and fruity blends. Yet it started out with the hop driven, yet still malty, Alpha Queen and has always had the odd pale ale and IPA floating around its core range over the years. 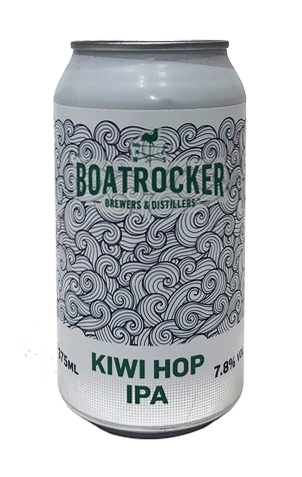 And thus it is that the fourth Boatrocker beer to go into cans is a new IPA. If you ignore NEIPAs and Brut IPAs, longer term trends in the world of IPAs have seen a move towards leaner, more tropical fruit salad style IPAs, but, as the brewery name suggests, following trends hasn’t really been at the heart of this business. Here, the focus is on Kiwi hops varieties, which add mango and soft citrus to the beer, but the copper hue hints that Matt Houghton’s fondness for characterful specialty malts – as in that debut beer in 2009 – remains. As such, there’s a prominent caramel sweetness there, one that ensures the beer doesn’t hit too hard in terms of bitterness, even as the 7.8 percent ABV goes to work gently warming you from the top down.